Iran has had several attempts to infiltrate deeply into the Yemeni society since the 1980s, but the Iran-Iraq war and Sana'a actual participation with its fighters alongside Baghdad against Tehran prompted the latter to declare the end of the war to attract a large number among young people belonging to the political Hashimite and Zaidi sect in Yemen. As part of the cultural exchange, Iran managed to recruit its supporters who are now leaders of the Houthi movement, some of whom returned early. Some returned after the Houthis invaded Sana'a on September 21, 2014. The Iranian leaders said that Sana’a became the fourth Iranian capital in their possession after Baghdad, Damascus and Beirut. Although the military relationship between the Iranian Revolutionary Guard and the Houthis is not visible - from a Western point of view - it was revealed after the Arab Coalition started its operations on 26 March 2015 to restore the state and legitimacy from the Houthis who besieged the government and chased the elected president. The war exposed the danger of the Houthi arsenal of ballistic weapons and other weapons after they seized military and security weapons with the help from former Yemeni ally on military and security weapons; in addition to an arsenal of arms that came from Iran that represents a real danger to the regional and international - not only Yemen. On December 19, residents of Riyadh heard an explosion that the Saudi authorities announced that it was their defense system as it had intercepted a ballistic missile coming from Yemen. This was not the first rocket by which the Houthis expressed their military capabilities. On November 4, 2017, the Houthis fired a ballistic missile at King Khalid Airport in Riyadh, a civilian facility that is more than 1500 km away from the Yemeni-Saudi border, indicates that these different capabilities were not within Yemen's arsenal of ballistic missiles. The Houthis say they have developed ballistic missiles and that they also targeted the UAE capital, Abu Dhabi, the second Saudi ally in the Arab Coalition, with a cruise missile targeting the nuclear reactor of Barakah, on December 3, 2017. The UAE denied this (). The United States of America, and Saudi Arabia and its Gulf allies accuse Iran of launching such missiles. 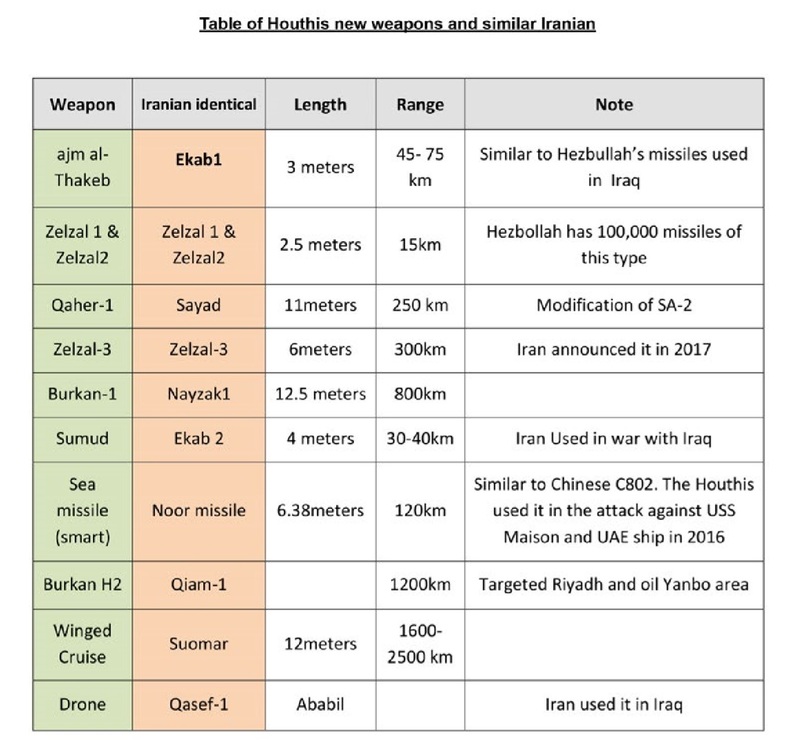 This paper highlights the growing capabilities of the Houthi force missiles (specifically) and its relationship with Iran, as well as giving an answer to how the strength of the Houthis reached this point! And the Iranian arms smuggling line. Before the Houthi invasion of the Yemeni capital of Sana'a in September 2014 and the start of flights between Tehran and Sanaa - continued until March 2015. Yemen already had an arsenal of ballistic missiles. This arsenal combines the arsenal of missiles that were owned by the southern Yemen state- the ally of Soviet Union before unification 1990 - in addition to missiles purchased by the regime of former President Ali Abdullah Saleh during his reign of power between 1978 and 2012. One of the main objectives of the Yemeni political transition period, which began according to the Gulf Initiative, was to remove ballistic missiles stocks from the hands of the Yemeni Republican Guard, an elite military force that receives direct orders from Ali Abdullah Saleh. The Republican Guard was headed by Ahmed Ali Abdullah Saleh until he was isolated by new Yemeni President AbdRabbo Mansour Hadi. But even after that, the loyalty of this elite force to the family of "Saleh" remained until al-Houthis defeated the Republican Guard and killed Saleh on December 4, 2017, two days after violent clashes between allies of the coup at the center of the capital Sanaa. When those efforts failed, the Saudis tried to destroy the ballistic missiles stockpiles by air raids when the Houthis took control of the Yemeni capital, Sana'a, a move that was fairly effective but the war prolong enabled the Houthis to get new technologies and missiles systems they claim that they developed themselves. "It seems that Iranian experts have helped the Houthis develop some of stored ballistic missiles to reach a larger range, but that was at the expense of the destructive capability of the missile's head, which means that firing such missiles at Gulf cities has no destructive effect, but messages of pressure and threat,” " missiles expert and informed government official said. () “The Houthis can get Korean missiles or Chinese or Iranian-made through the smuggling routes that the Iranian Revolutionary Guards master," he added. The report of the Security Council () that depended upon survey documents of the Yemeni defense force and arms data of the countries that exported weapons to Yemen, it was found that the remaining weapons are: "(384) tanks, (572) armored vehicles, (193) artillery, 75 jet aircraft, (2) Helicopters, (4) warships, (2) rocket launchers". There is no real knowledge of the number of ballistic missiles, but the international survey shows that there are medium and long-range missiles, including six Scud-B missiles merged after the unification of Yemen in 1990, they were the property of the southern Yemen state, in addition to 21 Toshka missiles. It is believed that the Yemeni army has 15 Huasong-6 missiles from North Korea, and that the missile brigades have 85 barrels of a chemical substance - believed to be received from Saddam Hussein's regime in Iraq - but military sources in the Yemeni army have confirmed that those barrels only contain fuel for missiles. The Houthis and Saleh have 45 Huasong-5 missiles, North Korea. These missiles were launched at the Saudi border and at the positions of the pro-legitimacy National Army in other governorates at various times. The Houthi militants began to use anti-tank guided missiles in their operations in August 2015, as videos by Houthis showed a missile attack on a Saudi Abrams tank on Saudi border as part of the Houthi movement's propaganda campaign on its Al-Masirah TV channel. The missiles that appeared in many videos have characteristics similar to those of the Russian-made Konkurs 9M113 and 9M133, but each missile has a similar Iranian one. According to the data, Yemen did not import any of those missiles. According to the United Nations team, it was noted that "TOW" missiles and their related electronic components were marked with the names of Iranian industrial companies. It was also noted that the Konkurs missiles were marked with characteristics similar to those of Russian and Iranian. It was noted that those missiles were probably subject to maintenance or repair in the Republic of Iran. Despite the naval embargo and the complexity of the arms access to the Houthis, Tehran was able to deliver arms to the Houthis through a variety of maritime and land routes. In an interview with Breaking Defense magazine, the chairman of the US Joint Chiefs of Staff, General Joseph Dunford, stated that Iran had not changed its aggressive behavior and that it continues to provide Houthis with cruise missiles and sophisticated equipment to target ships on the Straits of Bab al-Mandab. In May 2015, the Houthis announced a missile system called "al-Najm al-Thaqib 1 and 2" that are being launched from single and dual platforms, fixed and mobile. The Houthis said that these missiles could break the blockade that was imposed by the Arab coalition according to the UN Resolution 2216, without further details (in the issued statement). The range of the "Al-Najm al-Thaqib 1" is 45 km. It is equipped with a 50 kg explosive head. The length of the rocket is three meters (without fins). The Al-Najm al-Thaqib 2 has a range of 75 km. It is equipped with a explosive head that weighs 75 kg of highly explosive substance. These characteristics are similar to the Iranian "Ekab" missiles, similar also to the missiles owned by the Lebanese Hezbollah, called (Ekab 1 and Fajr 3). In August 2015, the Houthis announced a 17 km range Al-Sarkha "Scream" missile, carrying a 15 kg explosive head, 2.4 meters long, with a front detonator, and a hidden rear one that could be exploded remotely. In November 2015, the Houthis announced the manufacture of the Zelzal-1 and Zelzal-2 missiles launchers, a type of Iranian non-guided portable missile. The Iranian Revolutionary Guards produced Zelzal missile platform during the Iran-Iraq war (1980-1988). The Revolutionary Guards has an experience in distributing Zelzal platforms to militias. The Zelzal-2 technology - an alternative to the 610 mm platforms - was transferred from the original Zelzal of the Iranian Revolutionary Guards to agents such as Hezbollah. The Republican Guards also provided Hezbollah with other variants of missiles and shells produced by the Revolutionary Guards. In September 2016, the Houthis announced al-Sumud missile, four-meter-long and diameter 555 mm. The missile’s head weighs 300 kg and the total weight of the missile is one ton, the range of the missile is 38 km, the number of shrapnel is 10,000. An Iranian missile with the same specifications was used in the Iran-Iraq war, and was used by the Iraqi Hezbollah in Falluja. It is called "Ekab” missile. According to the shape of the missile, both have a conical head and fins at the back. In late 2015, the Houthis entered a new stage, the ballistic missiles stage, where the Houthis developed Russian ballistic missiles to reach a larger range and highly explosive capacity, but it can target nearby Saudi towns or other Yemeni cities. The Houthi movement announced in July 2016 the firing of a missile (Zelzal-3) into the Saudi Arabia. Some analysts classify and distinguish Zelzal missile to be similar to a short-range ballistic missile, a range of 65 km, length of 6 meters. Its head is one ton, and the number of shrapnel is 10,000. Al-Houthi may be a substitute for the original Iranian version. Closely, it does not appear that "Zelzal-3"() may have been produced domestically in Yemen, or the Iranian technology has been used in producing this missile. This missile is shorter and has bigger fins while the Iranian missile can be fired from the railway platforms. The Houthis' ability to develop weapons has increased, even as they have been able to threaten the Saudi capital, Riyadh. The Houthis have declared what they said "post-Riyadh" phase. This threat began with the announcement of the launch of Burkan-1 in September 2016. The Houthis claimed that they targeted the Saudi Taif city, but Saudi Arabia then announced that the missile targeted Mecca. The Houthis say it is the upgraded version of the Russian Scud-C missile. In August 2014, Iran also announced it has a missile "Nizak-2," that it said was the development of Russian missile (Scud-C). The range of both missiles (Houthi and Iranian) is 800 km, a length of 12.5 m and diameter 88 cm. Its head weighs a half-ton with highly explosive capacity, and the total weight of the missile is up to 8 tons. The Houthis announced that this missile was fired into King Abdulaziz Airport in Jeddah and King Fahd Air Base in October 2016. The two missiles are similar in shape, the conical head and rear fins. The Burkan H2 missile was first launched on July 22, 2017. The Houthis announced the targeting of Yanbu oil refineries in the western part of Saudi Arabia, at an estimated distance of more than 1,200 km. This threat was the most prominent threat to oil resources and also threatens most of Saudi cities. The missile was used to hit King Khalid Airport in Saudi Arabia's capital, Riyadh, on November 4, 2017 but was intercepted by Patriot missiles. According to international media,() the missile is very similar to Iran's Qiam-1 missiles. On December 3, 2017, the Houthis announced that they fired a "mobile winged missile" at a construction site for the "Barakah Nuclear Power Plant," located 230 km southwest of the UAE capital, Abu Dhabi. The UAE authorities denied the arrival of any missile. The Houthis said the missile was manufactured locally. The Houthis subsequently broadcast a video tape showing the launch of a missile connected to a jet engine and booster rocket, apparently a mobile platform. The missile landed in al-Jawf governorate, north of Sanaa, and did not reach its destination, activists said(). The missile was similar to the Iranian Soumar mobile missile,() which forms an Iranian version of the Russian Raduga "Kh-55" missile. According to the Stockholm International Peace Research Institute's weapons transfer database, several "Kh- 55” missiles were smuggled into Iran through Ukraine since sixteen years. () According to the Yemeni weapons data, there is no such type of missiles. The Iranian Defense Minister launched the production of Soumar missiles in March 2015. () Brigadier Hussain Dehghan said in a statement on the sidelines of a ceremony of unveiling the new missile that Soumar production based on modern technologies in navigation, propulsion and structure. He said the domestically-made missile can hit a broad range of targets in all circumstances thanks to its high tactical capabilities, long survival over the battlefield and radar-evading properties. According to the German newspaper "Die Welt", the first field test of the missile was conducted in January 2017. The missile reached 600 km. The maximum range of the "Kh-55" that is transferred from the "Soumar" missile is 2500 km and can reach a speed of 860 km per hour. On October 1, 2016, the Houthis announced the targeting of a civilian vessel operating with the UAE naval forces in the Red Sea. The USS Mason was also attacked three times with the same technique. Despite the Houthis denied the attacks, the US Navy said it had intercepted the missiles before they get to the target. A video of the missile that the Houthis fired from a seemingly mobile platform on the Red Sea coast, actually confirmed that the missile was a smart Iranian-made "Noor" missile (C802) that entered the service in the Iranian armed forces in 1991. In its specifications, "the missile is 120 km long and 6.38 meters diameter. The length of the engine is 1.24 m, while the weight of the engine is 715 kg, of which 150 kg is related to the weight of the semi-armored warhead. The missile can fly at a rate of 0.9 Mach." The Chinese missile has only a small amount of explosive material, estimated at 165 kg. The Noor missile is launched from mobile platforms and is guided by two "television" and "radar" methods. (The US Navy later confirmed those assumptions). In February 2017, the Houthi group in Yemen revealed that it had locally manufactured drones to carry out combat, reconnaissance, surveying, assessment and early warning missions. The aircraft manufactured were a model called “Hudhud”, “Hudhud 1”, “Al-Raqeeb”, “Rased” and “Qasef-1.” The most important tasks are to carry out technical and combat missions, including the role of artillery correction, monitoring and locating the enemy site and its forces and equipment and personnel, and sending information to the missile unit and artillery force and the force of support and evaluation,() which means that the aircraft role of combat is already suicide and target other sites. 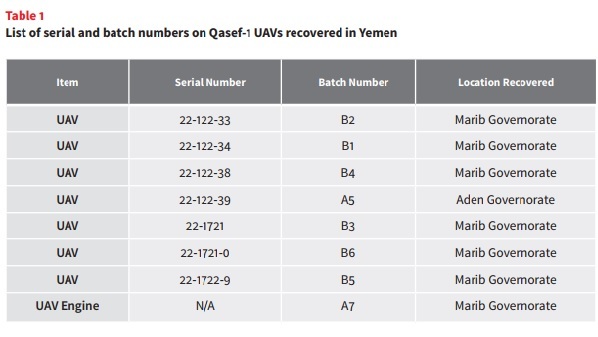 A report by the Arms Control Organization during the conflict in March 2017 noted that the unmanned aerial vehicles found in Yemen were of the type claimed by the Houthis to have been locally manufactured and called "Qasef-1", although their serial numbers and designs indicated that there is another form of a production line for Iranian drones known as "Ababil"(). 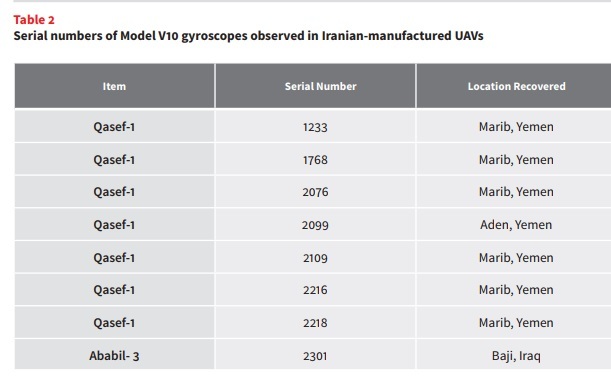 The center relied on its analysis of 7 unmanned aerial vehicles, 6 of which were captured in October 2016 by a well-known Iranian smuggling through Amman. Another one was found after an attack by the Houthis near Aden in Yemen in February 2017. The serial numbers indicate that another plane was shot down by the Iraqi forces during the battles with the Islamic State Organization (Daesh). The UAV was used by the Al-Hashd al-Shaebi “Popular Alliance” and fell into the hands of Daesh that managed to control the plane and re-broadcast information in its interest before being shot down by Iraqi forces. This type of UAV is manufactured by the Iranian company for the manufacture of aircraft "شركت صنایع هواعیمیمازازی ایران (هسا)". The "Iranian space force" depends upon it in the manufacture of weapons. The company says that the drone "Ababil" is one of its products. Have ballistic missiles been smuggled into Yemen?! A few months after the start of the Decisive Storm in Yemen, the Arab Coalition announced that the air raids targeted 90% of the ballistic missiles held by the Houthis. But until the end of November 2017, the Houthis continued to target Saudi areas, and the positions of the Yemeni Army and Popular Resistance. forces are present. This scenario is impossible because of the existence of the United Nations’ inspection mechanisms, which examine and check all shipments to Yemen in implementation of the Security Council Resolution (2216) that bans arms to Yemen. So it is difficult to smuggle a ballistic missile, 11-meter long, directly. Iran has already sent ballistic missiles to the Houthis crossing the oceans and seas, until those missiles entered through the smuggling ports to Yemen without any coordination with figures in the Arab Coalition or the United Nations. But this possibility is also weak due to the large size of a single missile. This scenario can be applied to the Iranian drones as the Yemeni Army intercepted many Iranian drones en route to Sanaa during smuggling attempts through the coastal smuggling line in southern Yemen. Iran has smuggled basic materials to manufacture or develop ballistic missiles in Yemen such as spare parts of vehicles or sensitive equipment. The Iranian weapons technology may be used for reprocessing inside Yemen, including rocket fuel and dismantled ballistic missiles. This is probably the closest scenario to reality. The Houthi group had a hobby of manufacturing ballistic missiles or self-development, and this is currently impossible because of the Houthis situation. Thus, if the third scenario is the actual scenario of Iran's smuggling of weapons, how is that?! Iran relies on smuggling weapons, including ballistic missile parts, into two groups: "Unit 400 and Unit 190" belonging to the Quds Force. The latter is responsible for the smuggling of weapons and modern technologies of wars outside the borders of Iran. Since the 1980s, the Unit190 used the state’s capabilities (aircrafts, ships, intelligence and politics) to its interest to form large weapons smuggling networks that include generals, security, naval and military commanders across the longitude and latitude of the geopolitical map of the Middle East. On the internet network, there is a site called Vsquds that is specialized in the operations of the Quds Force, including the smuggling of weapons to Yemen. The site refers to the "Unit190 – Unit of arms transfer". This Unit is one of the special units within the Quds Force that is responsible for smuggling weapons to its militias and areas of conflict, including Yemen. The site referred to the shipment of weapons (Jihan-1), which was dropped by the Yemeni government in 2012. The shipment that belongs to the Unit 190 contained 40 tons of weapons, including anti-aircraft missiles. The Jihan arms shipment was seized in the Arabian Sea, where Iran is seeking access to Yemen by virtue of the presence of international forces fighting piracy. US and French forces announced in 2017 that they had arrested three arms shipments coming from Iran on different dates, while the Arab Coalition has seized an arms shipment with its crew in the sea. Minister of Fisheries Fahd Kafayn said in (October 2016) that 40 Iranian ships (medium size) are trying to penetrate the territorial waters of Yemen. The Iranian contingent on Yemen uses a variety of methods to transport arms, which are shipped in the middle of goods to maintain secrecy, maximize cargo access to its destination and ensure that no link with Iran is detected if it falls into the hands of any other force. The smuggled weapons are usually concealed inside closed cages in a big container and surrounded with camouflage materials. To find out the concealed weapons, tons of cargo must be checked. Through Unit 190, Iran relies on the shipment to be registered as a relief or humanitarian aid and can pass easily through United Nations agencies and ports. The unit has developed advanced packaging methods that give the first impression that the goods in the containers are completely clear. It makes the shape of smuggled arms similar to the goods used for camouflage, such as milk powder, or building materials or even auto parts and household items. Iran has a history of arms smuggling across the oceans to its armed groups in all countries of the world. The sea route is easier and more flexible than other shipping routes, and the above-mentioned units smuggle these weapons. We can point to two main routes of arms smuggling to the Houthis. Oman denies these reports, but it is not a requirement that the central authority in Muscat is fully aware of what is going on. One of those who tend to close coordination with Iran is General Sultan bin Mohammed al-Nu'mani, Minister of the Sultan's Palace. The bulletin claimed that al-Nu'mani belongs to one of the most prominent Omani families, and officially oversees the state security apparatus, the internal intelligence service of Oman. Whether coordinated by Omani officials or not, the Sultanate, with its coastal strip, is a place of smuggling weapons as commercial goods through which Iran uses camouflage means and transport trucks through the Yemeni desert to the areas of the Houthis in Sanaa and Saada. In February 2016, the joint naval forces intercepted two sailboats manufactured by Al-Mansour, a company that manufactures sailboats and ships in the city of Konarak, Iran. Since 2012, it has smuggled heroin, cannabis and arms, as it has done recently. According to reports from Iranian organizations, Al-Mansour is located next to the headquarters of Iran's Revolutionary Guards. Iran was able to use a large smuggling network, owned by Ali Abdullah Saleh for smuggling weapons, coming from Latin America, across the Red Sea. Fares Mana’a, who was appointed by the Houthis as governor of Saada, 2012-2014, and included in the UN sanctions for the smuggling of arms to Somalia, was one of the arms dealers mentioned in a Reuters’ investigative report according Brazilian court documents. The Federal prosecutors in southern Brazil charged two former executives of Forjas Taurus in May with shipping 8,000 handguns in 2013 to Fares Mohammed Hassan Mana‘a, whom UN described as an arms smuggler active around the Horn of Africa for over a decade. It is known in Latin America that Hezbollah and Iran have drug network that offer forged documents and IDs, according to many international media outlets that have reported about that since 2009 until today. Do the Houthis build weapons? Information is circulated about the presence of Iranian and Hezbollah experts in Yemen in order to operate the Iranian weapons technology. This may be true to some extent, but such weapons industry requires considerable manpower to build. Informed sources - operating within a narrow frame within the armed Houthi group - leaked information on the presence of Yemeni experts in Iran, Lebanon and Pakistan for training. According to those sources that talked to the Abaad Center (), the war wounded Houthis who leave the country for treatment in India or Egypt or other countries, go for training in Iran on re-installing ballistic missiles of basic materials or the installation of materials that do not arrive from Iran through smuggling. Two sources told the Abaad Center that their relatives were on therapeutic trips in India and then left for Iran, then Lebanon and then Pakistan for military courses, most of which included modification or installation of missiles. Two other sources said they were involved in providing schema for constructing underground laboratories, 50 feet in deep and, steel-lined to avoid any air strike. It also has capability against any explosion, with all necessary security precautions. The Gulf initiative came after a popular revolution and the authority transferred from Saleh to deputy president, Abd Rabbo Mansour Hadi, who was already elected as the consensus president of Yemen in February 2012. A televised statement from Iran's Revolutionary Guards commander Mohammad Jafari November 2017 Iranian television showed the first channel.